Summer is upon us and I am ill-prepared. Each year, summer seems to creep up on me with its unpleasant, disgusting heat. Likewise, I’m also ill-prepared each year for bikini season since I’m busy eating chips and drinking margaritas up until July before I realize I now have a margarita-flavored muffin top I meant to get rid of in April so I’d have a Victoria’s Secret-worthy body by May. Unfortunately, that’s usually about the time I realize I despise working out and breaking a sweat is both excruciating and incredibly loathsome, and so I avoid it at all costs. This works wonderfully in my plan to drink more margs and eat more chips, but is sadly counter-intuitive to my model-body… unless we’re modeling the World’s Cutest Muffin Top, in which I think I have a good position in winning. Top five, for sure. But it’s so hard with backyard BBQ’s and Popsicles up the wazoo and pie. 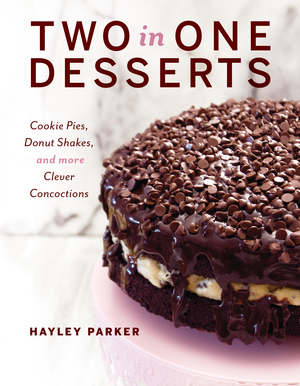 I know summertime usually embraces the whole “no-bake” thing, but pie is so quintessentially American. And I can’t blatantly be unpatriotic by abolishing all pie-eating on my part. That’s practically renouncing our culture. And I do not want to be un-American. Someone who proudly wears THESE shoes has to be patriotic and bake and eat pie. Obvi. 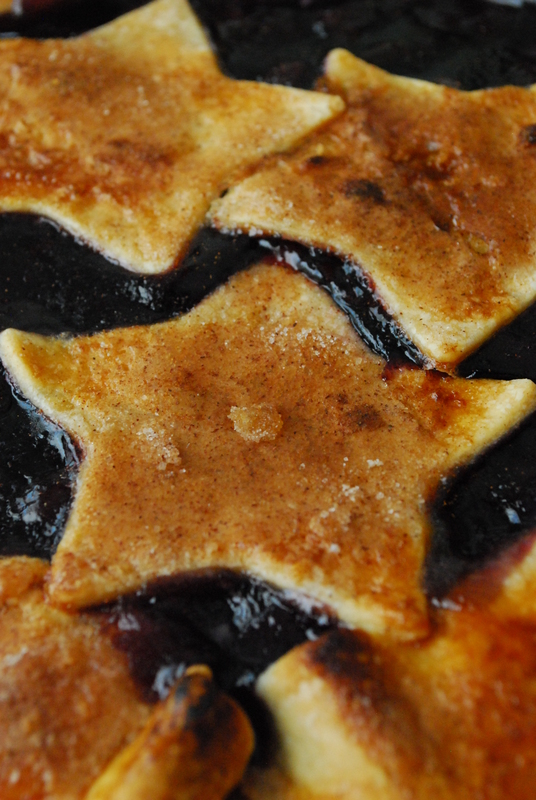 So for the upcoming holiday, I made a Blueberry Star Tart. It’s so simple to make–no more than 5 ingredients, really–so you can whip it up in no time and still have time to spare! Parading around the air-conditioned mall in American Flag platforms, perhaps? This tart is like a pie, minus the “traditional” crust. It also has the ends folded in, which makes it portable to hold. 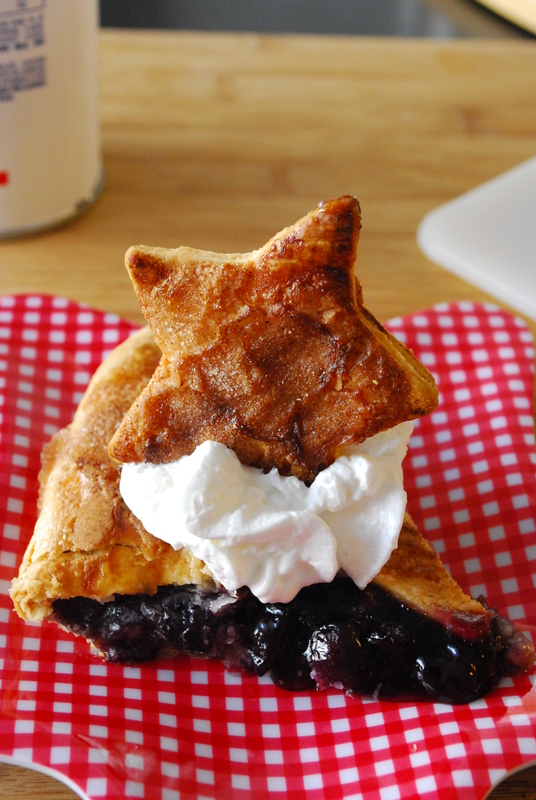 And the stars (cut out of the spare crust) are a fun, festive twist to the upcoming Fourth of July holiday. If blueberries ain’t yo thang, substitute strawberry pie filling, or even cherry. Or if you’re feeling fruity, try mixing strawberry, cherry & blueberry filling. See? So simple! Spread some white chocolate love in the bottom of the crust. 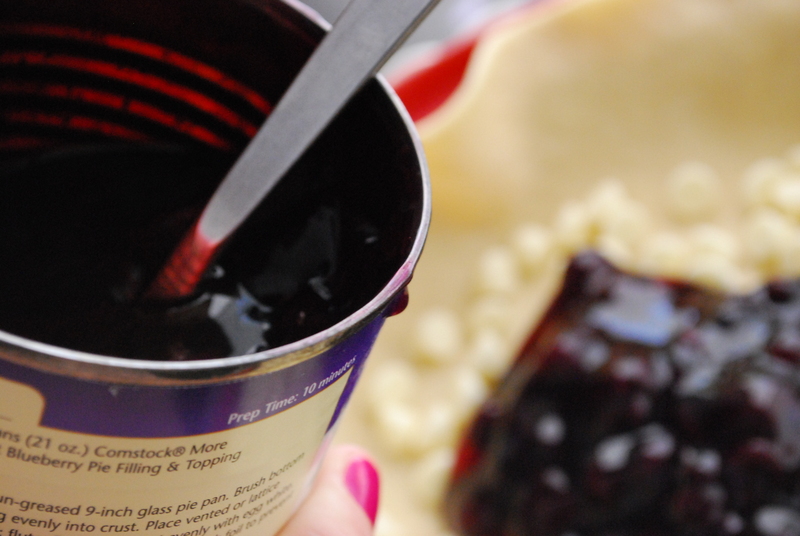 Top that with your blueberry pie filling. Cans make life easy, but feel free to make your own if you’re an over-achieving fancypants. Fold the edges of the crust partially over the filling. Now let’s prep them stars. 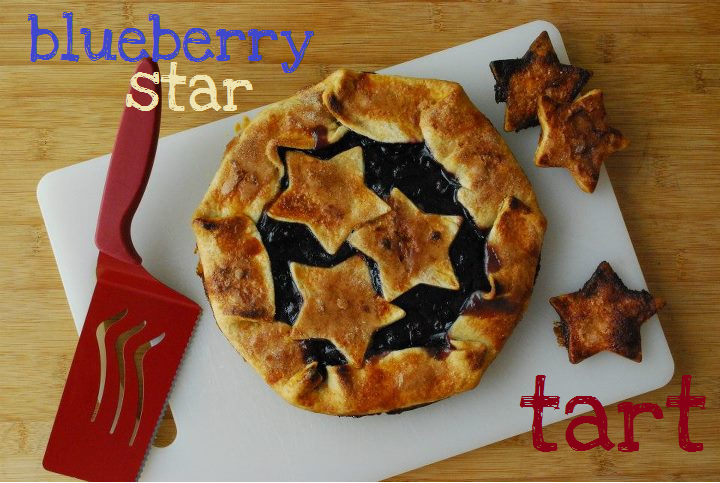 Cutie stars, meet blueberry tart. Give them a light smattering of egg, followed by a generous sprinkle of cinnamon sugar. Then bake that sucker up for 25 (long) minutes. 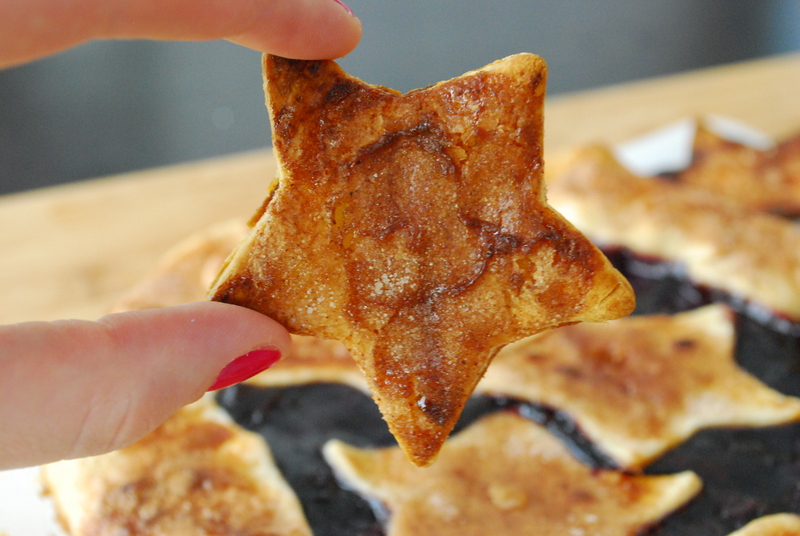 After it cools for awhile, cut it into adorable wedges, served with extra crusty stars on the side. Cinnamon sugar crust chips=world’s best invention. EVER. 1. Preheat oven to 400 degrees F. Liberally grease a 9″ pie plate with cooking spray. 2. Roll out one of the pie crusts and gently lay it into the greased pie plate. 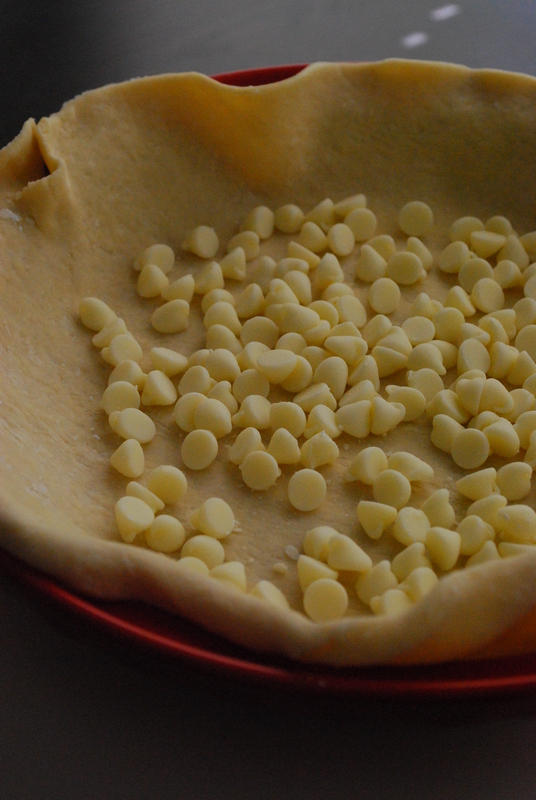 Sprinkle the bottom of the pie plate with the white chocolate chips. 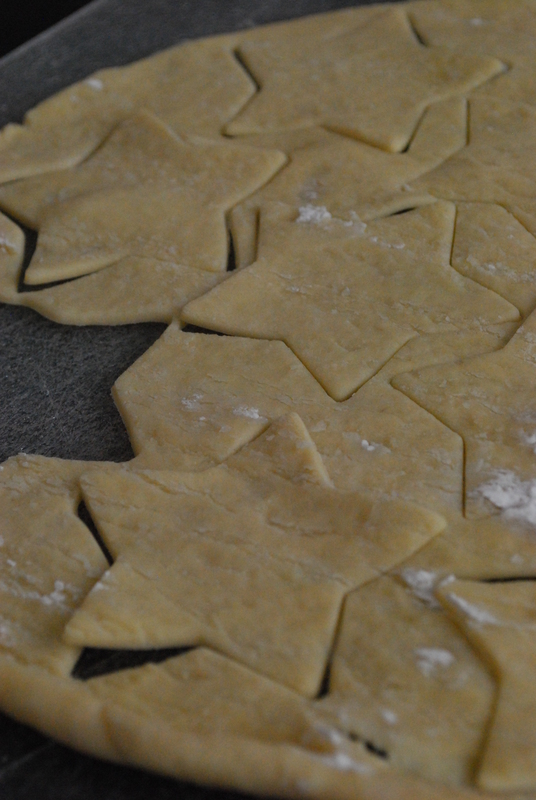 Roll out the remaining crust and, using a star cookie cutter, cut star shapes from the second crust; set aside. 3. Pour the blueberry pie filling into the pie shell, covering the chips. Spread into an even layer. 4. 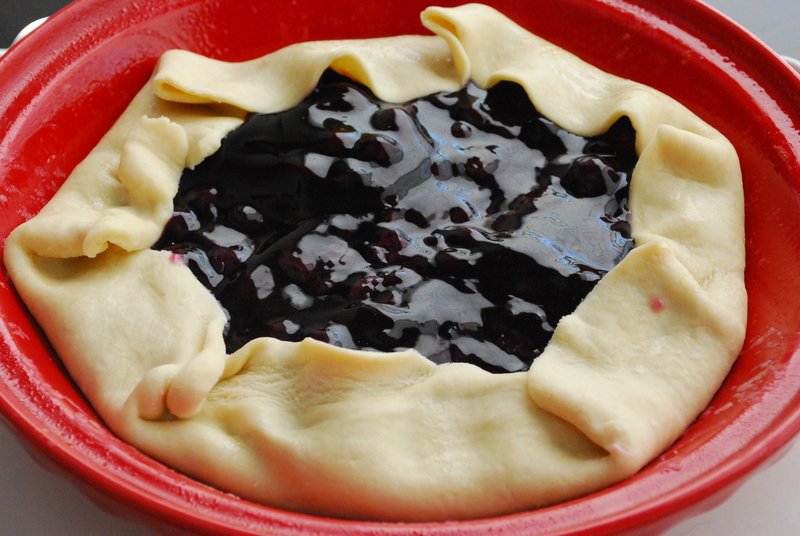 Gently fold the sides of the the crust onto the blueberry filling; it’s okay if the crust overlaps (that’s the rustic beauty of it, really). 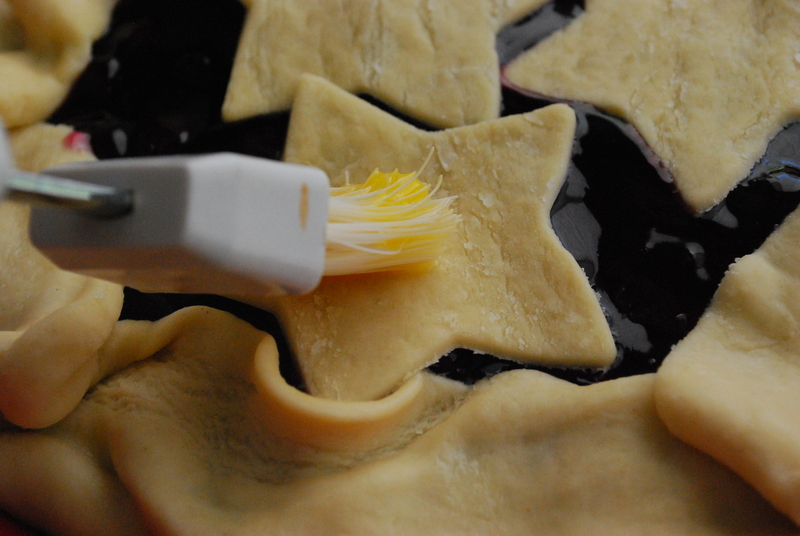 Top the center of the tart with three stars (or as many as you can fit without overlapping the stars). 5. 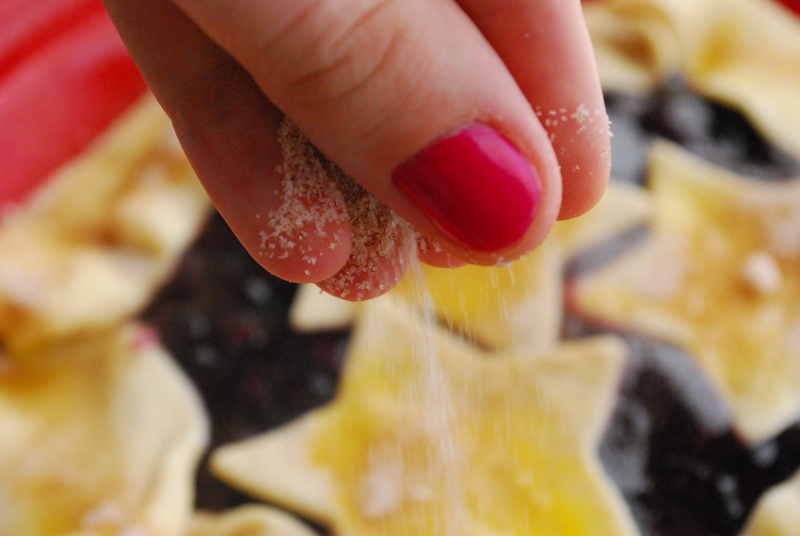 Brush the crust and the stars with the beaten egg; sprinkle liberally with the cinnamon sugar. 6. Bake for approx. 20-25 minutes or until golden brown and filling is bubbly. 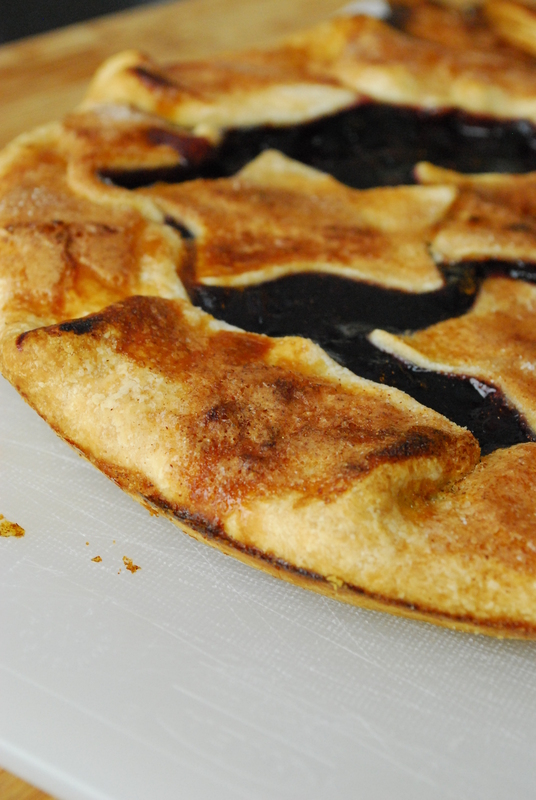 Allow the tart to cool about an hour and a half before gently removing the tart to a cutting board to finish cooling. Cut into wedges and serve with whipped cream, or a la mode. Oh BTW, watch out for those star chips… they are freaking dangerous. Gah! That picture with the sprinkling sugar over the stars? Perfection! I heart blueberry anything. This tart is gorge. Totally worth a little extra muffin top 🙂 Also, now I really want a margarita. Yes, it’s 6 am. I do not have a problem…. I can easily drink margs ALL.DAY.LONG. So damn good! Marg party? Yeah, pretty sure I would be picking at the crust of this pie until it was gone! & therefore ruin the entire appearance. Um, that’s kinda sorta EXACTLY what I did. I had two full, real pieces–and the rest was crust. Dang. Yeah, chips and salsa and guac for sure are a staple yearround. I mean, helloooo, I’m from California. I can’t not eat avocados like it’s my job 🙂 thanks doll! Mmm…I love blueberry! And stars and white chocolate make it even better. 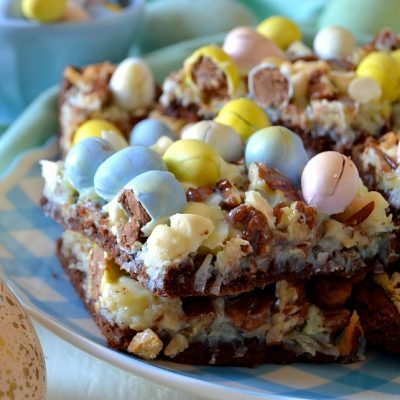 Omg you put white chocolate in there? You’re awesome. And, btw, when you come hang out for margs with me soon, you can be assured you do have a VS body, in comparison to what’s around you, lol. We BOTH have VS bodies, okay?! Those bitchy models just don’t know what’s about to infiltrate their toothpicky world. Plus, we’ll have the margs and be the most popular hotties around, just you wait!! 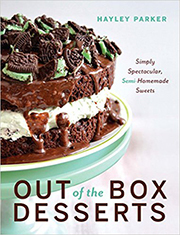 Can’t wait to make these tarts! right. This post actually made my day. You can not consider just how so much time I had spent for this info!